“This stuff is not just ordinary diamonds-and-rubies-junk,” explained Elizabeth Taylor when she was talking about David Webb’s jewels to Cosmopolitan magazine in 1968. “This is now—it’s very chic.” The American designer’s bold gold, wild animals and larger-than-life riffs on Art Deco themes absolutely caused a sensation when they were first launched during the ‘60s. He was one of the hottest jewelers of the period, in a way and at a level we simply don’t see anymore. President John Kennedy and First Lady Jackie Kennedy—who was a fan and client—commissioned David Webb to create objects with American gemstones for gifts of state. The Duchess of Windsor had a Webb green enamel twin frog bracelet and matching earrings. 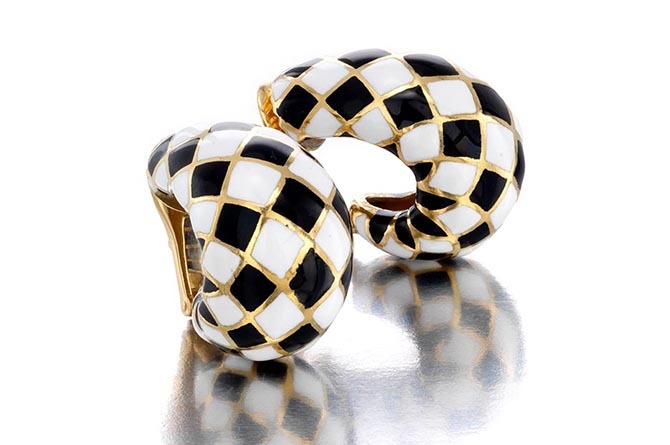 Diana Vreeland sported the designer’s domed drop ear clips in black and white enamel and one of his zebra bracelets. 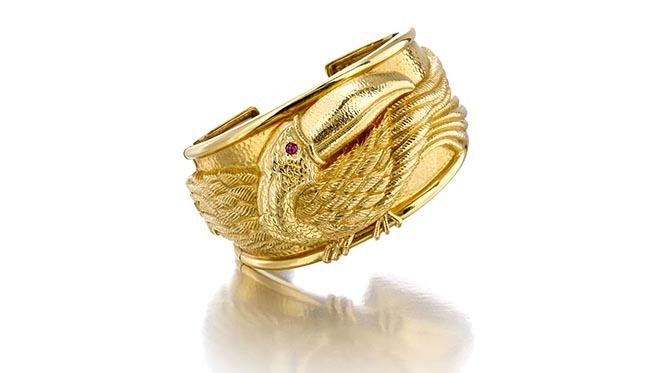 Legendary Cosmopolitan Editor-in-Chief, Helen Gurley Brown was, according to the designer’s biographer Ruth Peltason, “known for her Webb jewelry.” One of her pieces was a gold animal cuff similar in style to the toucan jewel below. 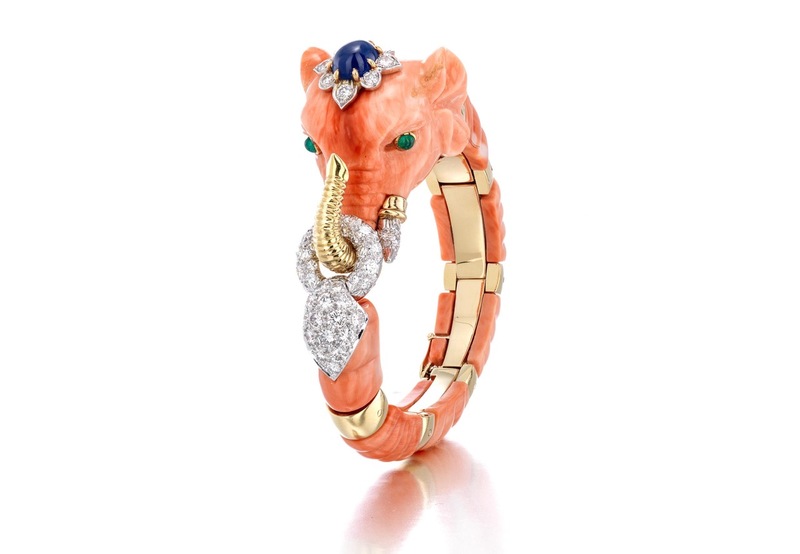 While gorgeous David Webb jewels consistently appear at auctions, what is rare to see is one woman’s incredibly chic and totally wearable, comparatively comprehensive collection. Just a few Webb jewels were in Jackie Kennedy’s 1996 estate sale. 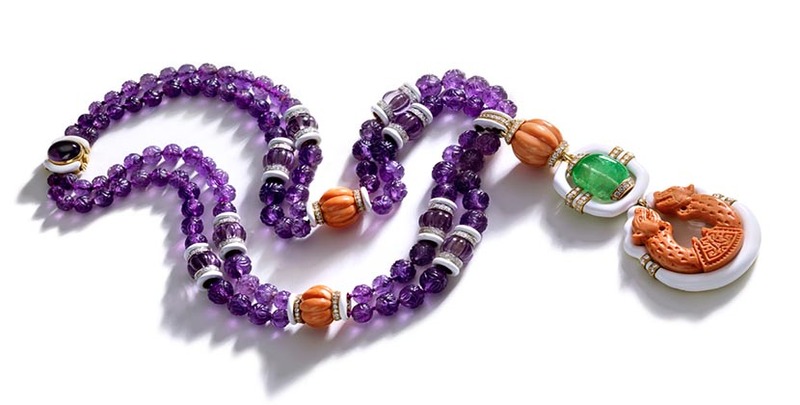 Helen Gurley Brown’s jewels have never appeared at auction since she died in 2012. 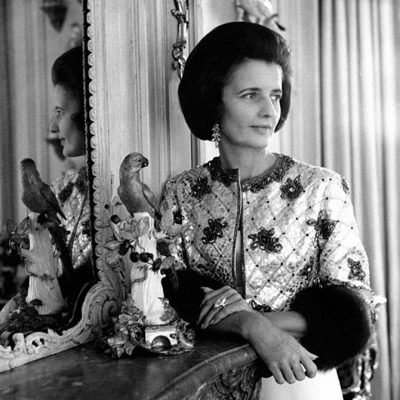 The Duchess of Windsor, Diana Vreeland and Elizabeth Taylor only had select holdings of Webb. In the Bonhams New York Fine Jewelry auction on April 17, 2018, there is one of the largest single owner collections of David Webb I have ever seen. The array of 17 jewels is divine. While the owner’s identity remains anonymous, her excellent taste is clear. Just looking at how perfectly the pieces are edited gives me a deeper understanding of why he was such a fashion darling. There are the sensational statement jewels and pieces with pops of color. There are also beautiful basics, neutral black, white, gold and diamond jewels. When you look at the collection, its easy to see how a stunning choice could be made from the owner’s jewel box every day. What’s also great is how it features so many of David Webb’s iconic styles. See more highlights below and visit Bonhams.com to view the complete collection. To analyze the array in real life, drop by one of the auction house’s previews in Los Angeles (April 4-8), Geneva (April 9-10) or New York (April 13-16). The sale takes place at Bonhams in Manhattan on April 17. 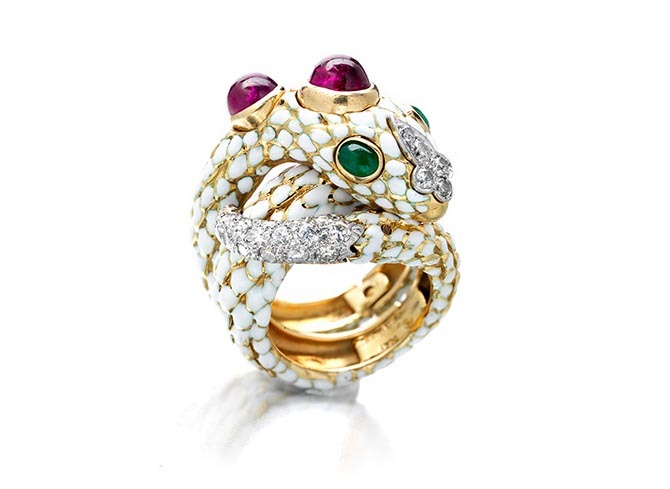 There was more than a little bravado delivered by David Webb with his animal jewels when they launched in the 1960s. 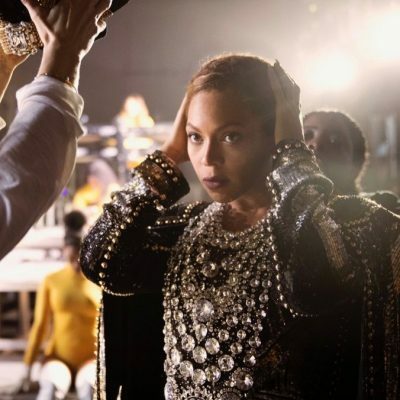 The designer told fashion columnist Ruth Preston, “We’ve had the sweet things, the flowers and the little arrangements. It’s time for boldness and simplicity. 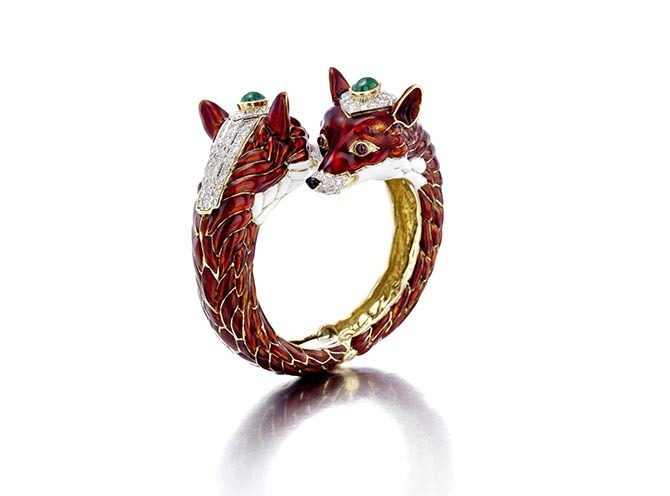 Animals are here to stay.” Webb’s magnificent menagerie was composed of carved stones or covered in enamel. Elegant gems added a layer of regal details to the creatures. David Webb designed any number of jewels with frogs. There were gold bracelets and necklaces and, of course, the green enamel frogs owned by the Duchess of Windsor. None of them quite have the narrative implied in the piece in the collection at Bonhams. 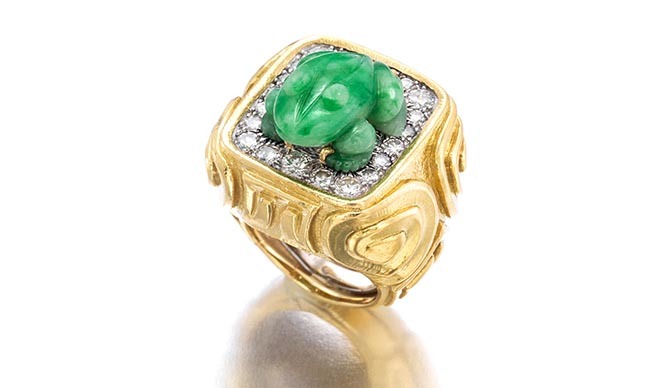 The carved jadeite jade frog rests on a diamond lily pad on top of a gold ring with abstracted heart motifs. One can’t help but think this frog was Webb’s Prince Charming. While David Webb is famous for statement jewels and amazing animals, the designer also made beautiful basics. 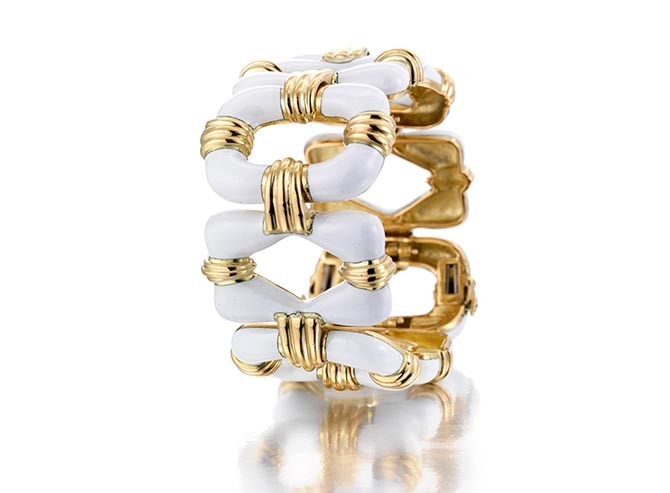 The collection at Bonhams has several covetable examples including sensational white enamel styles.